The ceaseless sight was in the house for months, listened to many a time, but for some reason I never got to writing a review. When The ceaseless sight came by more or less randomly I decided to make amends straight away. Rich Robinson surprised me with his previous solo record, 'Through a crooked sun', which was one of the first reviews on this blog in the winter of 2012 (http://wonomagazine.blogspot.nl/2012/02/through-crooked-sun-rich-robinson.html). Where The Black Crowes at times, and ever since 'Amorica' always, sounded to forced to me to truly enjoy, Rich Robinson proved to be a fine composer and very adequate singer. This line is continued on The ceaseless sight. On the album Rich Robinson explores some well known avenues of southern rock, rock and even some country rock/folk rock in which acoustic guitars are brought to the frontline of the song. In a song like 'One road hill' the Eagles come to mind, but Robinson manages to avoid the top heaviness the Eagles have in several of there most famous songs. While in 'The giving key' his old band was on his mind. It is quite clear who is responsible for a song like 'She talks to angles'. The gospel choir in the background gives the song a lot of extras. It is in the details that Rich Robinson manages to make his songs interesting. As such The ceaseless sight is not special. This kind of songs have been released for the past decades. By making the dynamics work within a song, adding background vocals at the right time, adding an instrument here or there, Robinson captures my attention with every song. The foundation however is the fine melodies that most songs have (where I had my doubts there with The Black Crowes often) and the voice of Rich Robinson that simply appeals to me. More so than his brother Chris'. As a producer Rich Robinson seems to have a good ear for what his songs need. Although the basis is simple: guitar, bass, drums, keyboard, a piano. In all the right places an extra guitar of slide guitar is added. A piano comes in from the background and voices twist themselves around Rich Robinson's voice. Even when the tempo goes down in the ballad 'I have a feeling', there is a lot going on that gives the song a flavour of its own. The funky guitar notes add a psychedelic touch, the three note slow riff in the foundation of the song brings the backdrop it needs. Piano and organ do the rest together with the double tracked vocal. Do I have an explanation for the fact that I think Rich Robinson's music is better than his former (?) band's? Yes, he has moved a little in the direction of The Rolling Stones' sound of the early 70s and dips his pen a little less into the well called Faces. More melodic and less riff based. Just listen to 'I remember' and you will know what I mean. Keith Richards all the way and including some Mick Taylor playing as well. And thus Rich Robinson convinces in the rockers and the ballads, with 'In you' as another great example of a ballad. Towards the end of the album the rock again receives some light psychedelic overtones. No, don't take out the fluid projector, there's no need to do that, but the guitar playing gives me ideas for putting one of Traffic's albums on, while I'm listening to 'Obscure the day'. 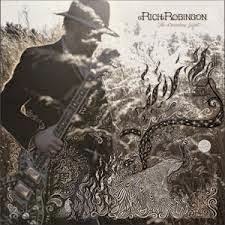 In conclusion it is easy to write that Rich Robinson with The ceaseless sight has released another fine album. Not original but certainly entertaining with the right kind of quality in plain hearing. I don't think he'll ever have the following The Black Crowes were used to, but fans certainly ought to pick up their copy. The ceaseless sight is good.